Pearson Medical Technologies offers the simplest, portable, powerless, and safe deblistering product recovery machine. Its easy to use features make manually deblistering simple and easy. 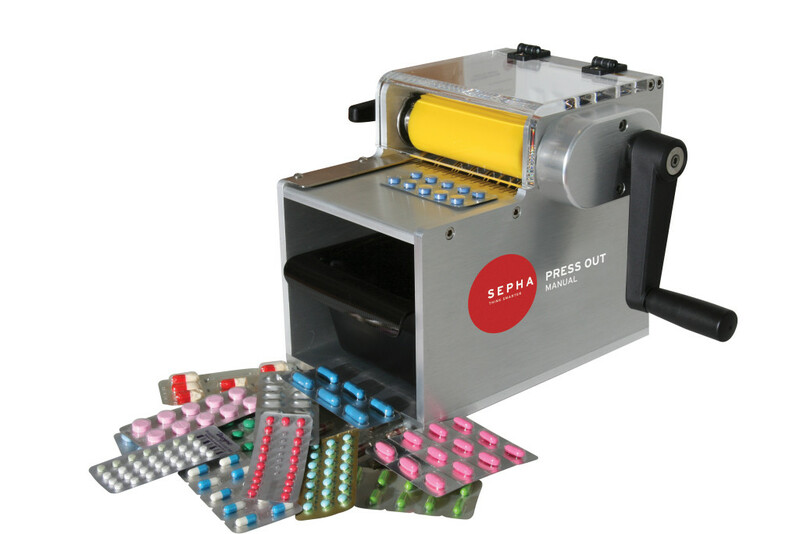 Blisterpacks are manually fed through the rollers by turning the handle, and tablets or capsules are gently removed from its packaging and separated into a collection drawer without any damage to the pill. The collection tray is easily removed for cleaning to prevent cross contamination from pill dust. The Deblister Manual Press’s non-slip safety pads is fully cGMP compliant and requires to electricity or air supply. This machine does not require additional deblistering tools or changing parts. All product contact areas are stainless steel 316 and ABS food grade. Press-Out Manual is perfect for operations which need flexibility for lots of different blister push-through formats. The patented mechanism is adjustable for many different push-through blister formats. There is no need to purchase a different set of change parts for every different blister pack. Remove pills from blisters which have been rejected from the packaging line because of empty pockets, poor seals, incorrect batch coding etc. The good product can then be repackaged to increase yield and reduce wastage costs. The same drugs are often supplied to different countries in blisters of different formats with the foil printed in local languages. Manage fluctuating market demands by deblistering surplus stocks of finished blister packs and re-packaging the contents in formats to suit the needs of other markets. When the product reaches the end of its shelf life it needs to be destroyed. For reject blisters containing toxic product, there is often an expensive disposal process if the product is not separated from its packaging.